Welcome, Fans of Mitch Stephen! Thank you for visiting from Mitch Stephen's Real Estate Investor summit podcast. Below are some of the services we discussed on the interview. And since you are a Mitch Stephen fan, we offer a 20% discount on our LinkedIn Lead Generation service...our favorite, most powerful social media tool with true ROI. If you're interested in this, please mention the podcast when we have our discovery call. Missed the podcast? Click below to listen now. We can help you grow your social proof and authority by creating and posting relevant, unique content to your social pages. We have custom solutions available depending upon your needs. Click below to learn what it is and why you need it. We have an affordable content service if you're in any field related to real estate. Let us post for you every day, for only $97 per month. What's even better? If you use coupon code MITCH10, you'll get $10 off per month. Click below to sign up. Does your website need a makeover or are you looking to create a new one? Our web design team can create a beautiful, modern, mobile-friendly website for you. For a limited time, we're slashing the design fee! You only pay $99 per month for a 1-5 page website. Click below to learn more. No problem! Use the button below to schedule a time to meet with our Founder, Claudia Loens. Together, you can strategize about what it will take to make your business have an awesome online presence! "WordFlirt knows social media marketing and will cater to all your marketing needs. Claudia Loens exceeds expectations and offers a hands-on approach as if your company is her company. She offers a full service approach to marketing. She maps out the marketing plan just for you and her expertise covers any unexpected snags along the way. Her results are extraordinary: I was able to exceed my social media goal in 3 months. You won’t be disappointed with WordFlirt’s services and support!" 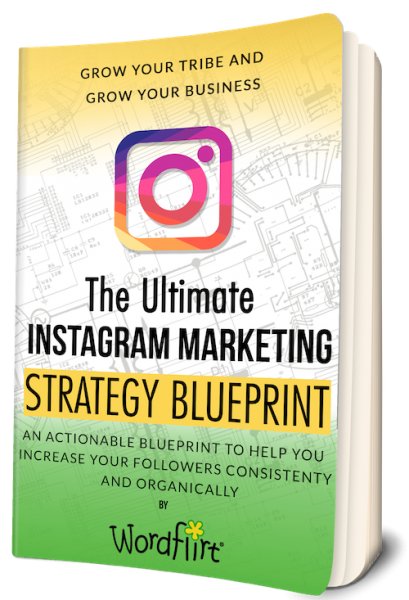 Enjoy our free copy of the Ultimate Instagram Marketing Strategy Blueprint. Your step-by-step guide to growing your Instagram following with easy to follow instructions and worksheets. Click the button below to get the download and sign up to receive social media tips. Don't worry - we promise to focus on sending you marketing tips to help you grow your business. You can opt out at any time if you don't like our stuff!